Acting Interior Secretary David Bernhardt is scheduled to appear before the Senate Committee on Energy and Natural Resources on March 28 for a full committee hearing on his nomination to become the next Interior Secretary. Before joining the Trump administration, David Bernhardt was a high-powered lobbyist and lawyer for oil, gas, and mining industries. 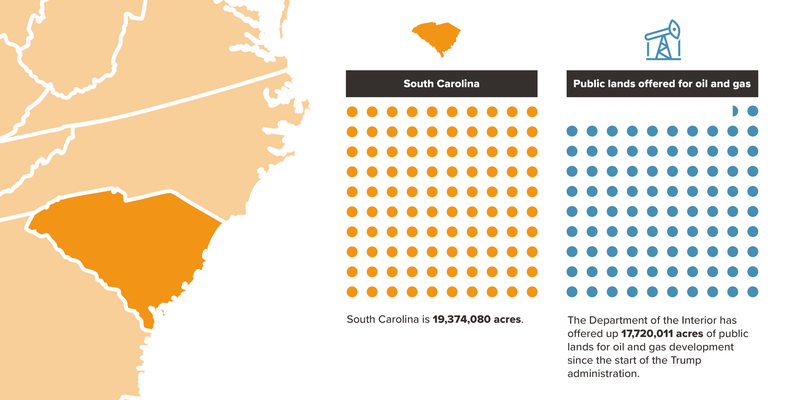 As Deputy Secretary under former Secretary Ryan Zinke, Bernhardt was behind some of the most controversial and consequential policy decisions issued by the Interior Department’s leadership, including stripping wildlife protections, undoing national monument designations for mining and development, and offering vast swaths of public lands — nearly the size of South Carolina — for oil and gas leasing. To accomplish such controversial and unpopular policy decisions that directly benefit his former lobbying clients, Bernhardt has cut out the public from the policy making process and refused to turn over documents upon request from Congress. Here are the top reasons why David Bernhardt is unfit to head the agency charged with stewarding America’s public lands. In financial disclosures and ethics recusals, David Bernhardt lists more than two dozen former clients. 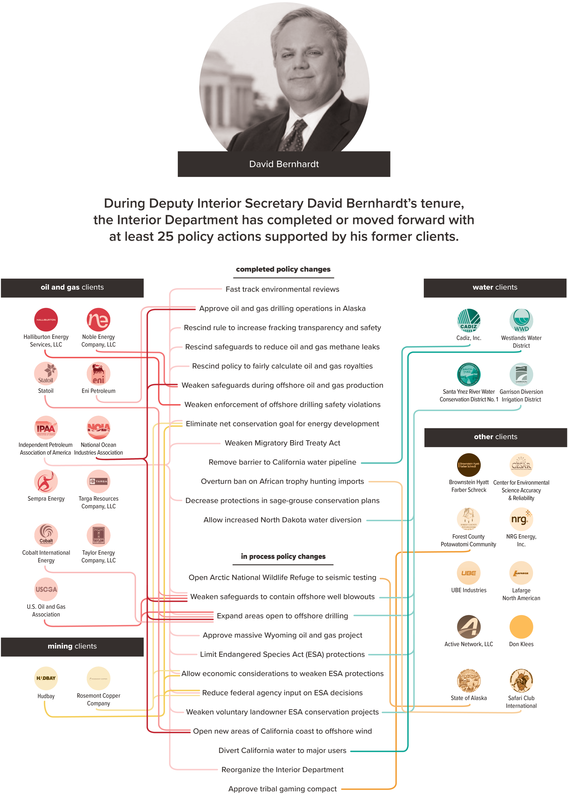 During Bernhardt’s tenure at the Interior Department, the agency has completed or advanced at least 25 policy actions that have been requested or supported by at least 16 of his former clients. According to an analysis by the Center for American Progress, David Bernhardt is the most conflicted of all of President Trump’s cabinet level nominees. Nearly three-quarters of Bernhardt’s 27 former clients listed on his recusals have actively lobbied the Interior Department since 2017. According to the Washington Post, Bernhardt has so many conflicts of interest that he carries a list of his former clients in his pocket. Bernhardt’s calendars released to the public are overwhelmingly void of meaningful details, with hundreds of hours of “internal” and “external” meetings lacking descriptions of who he meets with. While Bernhardt and his staff have fought to keep his calendars secret, a number of undisclosed meetings have been with oil and gas industry representatives, including the American Petroleum Institute. Last week, Senator Tom Udall and Representative Betty McCollum wrote a letter to Interior’s Office of Inspector General calling for an investigation into the ethical irregularities of David Bernhardt and asking for a review whether the ethical policies that apply to Bernhardt are sufficient. To prevent additional information from being released to the public, Bernhardt’s Interior Department proposed rules to limit Freedom of Information Act requests. A bipartisan group of lawmakers, including Senate Finance Chairman Chuck Grassley and House Oversight Chairman Elijah Cummings, wrote a letter to Bernhardt saying the “proposed rule needlessly encroaches” on the public’s right to government information. Bernhardt’s home state senator, Colorado’s Michael Bennet, has already announced he will not support Bernhardt’s nomination. Senator Bennet’s position on Bernhardt is in line with the sentiment of most Colorado voters. According to a Keating Research poll released by the Center for Western Priorities, when Colorado voters were asked what direction the Interior Department should move towards, 74 percent said Interior must do a better job striking a balance between preserving public lands and responsible energy development, 18 percent said what mattered most for the department was increased oil and gas development, and only 3 percent said having a Colorado native running the department was important. Additionally, 77 percent of Colorado voters are concerned (35 percent very concerned, 26 percent somewhat concerned and 16 percent a little concerned) that clients David Bernhardt previously lobbied for have business before the department he currently runs. A poll released last week by the Western Values Project found that Colorado voters overwhelmingly think David Bernhardt should not be confirmed by the Senate and oppose his energy agenda — just 34 percent support his confirmation while 49 percent disapprove. Coloradans disapprove of Bernhardt’s proposed changes to the Endangered Species Act (71 percent disapprove), shrinking the size of national monuments (69 percent disapprove), and expediting oil and gas permitting (67 percent disapprove). 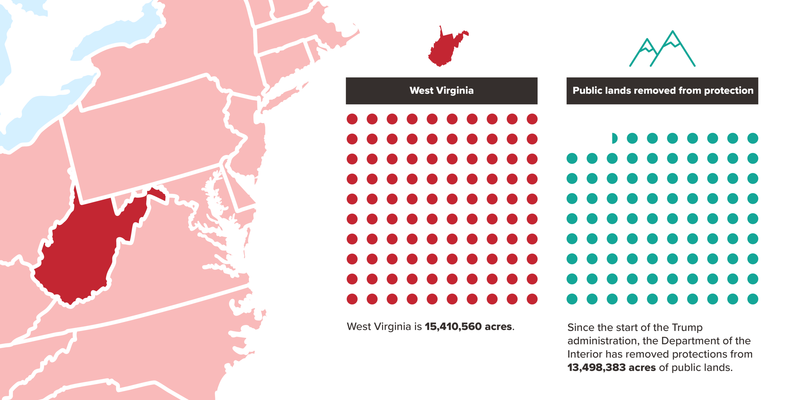 As part of Trump’s “energy dominance” agenda, Bernhardt’s Bureau of Land Management has offered more than 17 million acres of public lands for oil and gas leasing since 2017. Leases for oil and gas development covering more than 2.9 million acres have been purchased at auction. During the latest federal government shutdown, Acting Secretary Bernhardt recalled Interior employees to process more than one hundred offshore and onshore oil and gas drilling permits and environmental reviews — at least 73 permits were for companies with ties to Bernhardt. Members of Congress have sent two letters to Bernhardt asking for an explanation — Bernhardt has not made a response publicly available. As Deputy Interior Secretary, Bernhardt has led the agency’s charge to undermine the Endangered Species Act. During his tenure, Interior proposed policy changes to weaken protections for threatened species by allowing economic considerations to override wildlife protections and limiting input from other federal government agencies. Just four months after joining the Interior Department as deputy secretary, Bernhardt directed Interior staff to weaken wildlife protections for California’s delta smelt — a narrow policy change that would directly benefit one of Bernhardt’s former clients, Westlands Water District. Senators Richard Blumenthal and Elizabeth Warren, in addition to the Campaign Legal Center, sent letters to Interior’s Inspector General and a top ethics official expressing significant concern about Bernhardt taking actions to benefit Westlands Water District. 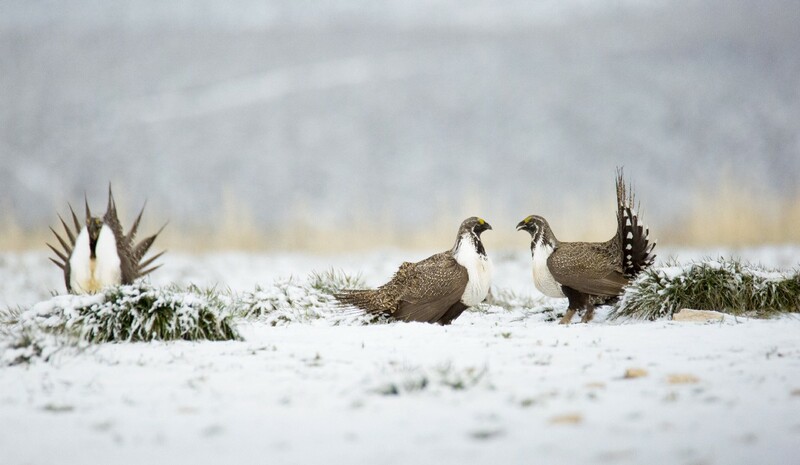 Earlier this month, Bernhardt announced finalized changes to sage-grouse conservation plans covering seven Western states — removing wildlife protections over 8.9 million acres of sage-grouse habitat as the specter of an endangered species listing looms over the bird. 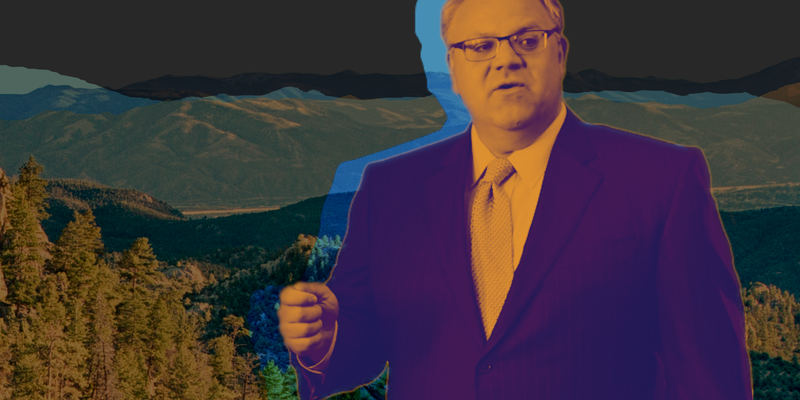 Oil and gas companies with ties to Acting Interior Secretary Bernhardt own more than 20 percent of all federal oil and gas leases that overlap with sage-grouse habitat across five Western states — Colorado, Montana, Nevada, Utah, and Wyoming. One in five of all oil and gas leases offered since the start of the Trump administration have been in areas identified by states as important wildlife migration corridors. President Trump’s Interior Department has removed nearly 13.5 million acres of protections from public lands across the country, including major reductions of two national monuments in Utah, as well as millions of acres of sagebrush habitat across the West. A news report revealed that the Trump administration met with a uranium mining company with claims inside of Bears Ears National Monument before announcing an executive order to review monument designations. Documents released following a House Natural Resources Committee Hearing revealed that Interior officials directed Bureau of Land Management staff to remove coal resources from the boundaries of the redrawn Grand Staircase-Escalante National Monument, regardless of the monument’s paleontological resources and against the recommendations of the Bureau of Land Management. Despite widespread support for public land conservation in the West, Acting Secretary Bernhardt has made it clear he has no interest in protecting America’s national parks. Congress’ recent bipartisan reauthorization of the Land and Water Conservation Fund (LWCF) — a critical source of funding for public land access and recreation — appears to have had little impact on the funding priorities laid out by President Trump and Acting Secretary Bernhardt in the Fiscal Year 2020 proposed Interior Department budget. The proposal asks Congress to eliminate 95 percent of federal-level LWCF appropriations, leaving critical parts of national parks, public lands, and wildlife habitat at risk of development. In addition, the 2020 budget would cut the National Park Service budget by 17 percent, eliminating hundreds of jobs from the park service and cutting $113 million from major maintenance and construction needs. If you’d like to watch Acting Secretary Bernhardt’s confirmation hearing, you can tune in here at 8:00am Mountain Standard Time on March 28. There are a lot of questions that need to be answered, but one thing is clear: America’s public lands deserve better than David Bernhardt.